Margaret Polson Murray, founder of IODE, sent telegrams in the fall of 1899 to all the mayors of the Provincial Capitals outlining her plans for an organization to stimulate patriotism and support those forces fighting in South Africa. The mayor of Fredericton, New Brunswick, Harry Beckwith, called a meeting of the women of Fredericton in his Council Chambers on the 15th of January in 1900. 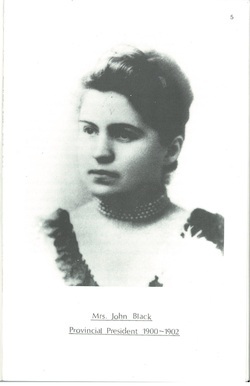 Thirty-seven women participated in the meeting and elected an executive with Mrs. John Black as President. They named the organization, "The New Brunswick Auxiliary", and began fund raising. They notified Mrs. Murray that they had responded to her suggestion and had begun fund raising. Mrs. Murray replied that she had decided that this wasn't a good time for the project. Mrs. Black responded immediately that they had collected so much money for the Patriotic Fund that it could not disband. By February 13 Mrs. Murray gathered a group of women in Montreal "to consider the proposal that the women and children of Canada should federate as Women and Children of the Empire and should ask the women and children of other colonies to do the same." This time she was successful and chapters were formed in Quebec. As the result of the Montreal meeting February 13th has been considered 'Founders Day" by IODE. The New Brunswick Auxiliary is considered the first Provincial Chapter. IODE is proud of its heritage and traditions. In 1900 Margaret Polson Murray of Montreal encouraged the formation of a federation of women to promote patriotism, loyalty and serve to others. The first chapter, Federation of the Daughters of the Empire, was formed in Fredericton, New Brunswick on 05 January 1900. Primary chapters were formed in quick succession across Canada as were junior chapters. In 1901, the Federation was incorporated as the Imperial Order Daughters of the Empire and Children of the Junior Branch. IODE was incorporated as a Canadian women's organization a special act of the Parliament of Canada in 1917. Under the jurisdiction of the National Chapter of Canada IODE are provincial, municipal and primary chapters across Canada. With approximately 3000 members across Canada in more than 200 chapters, the IODE tradition of serving children, youth and those in need continues. The name of IODE was officially adopted in the 1970's. We are a federally chartered charitable organization. IODE Canada across Canada undertake an extensive variety of charitable and philanthropic projects every year. These include financial assistance and contributions of time and effort to students, educational institutions, hospitals, the underprivileged and those in need. IODE Canada is a registered Canadian charity and we welcome donations in any amount to support the good work of our organization.